Order your Supri Sopressata (Soupy) today. Offering 6 flavors from Sweet to Extra, Extra Hot! 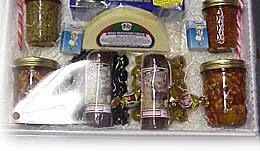 - Dipper's Packaging Co., Inc.
Order as many individually packed “SUPRI” as you like. great idea for all occasions. 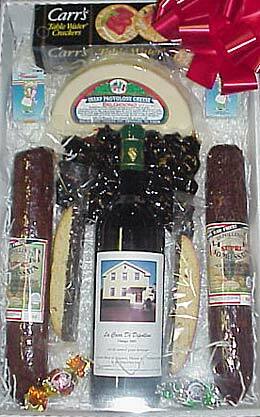 Order Your “SUPRI®” Sopressata Today! PLACE YOUR ORDER: Phone or Email today. Choose the “SUPRI” to please your palate, there are 6 flavors to select from. For those of you that cannot enjoy hot and spicy, we have a sweet “SUPRI” that has just a slight amount of pepper for flavor. Children can enjoy this one. This style has been enjoyed by almost everyone that has been fortunate enough to sample or purchase it. It has just the right “bite”. This style will let you know that you are stepping up into the hot and spicy zone. This is not for everyone, but if you like hot & spicy then this is the one for you. This style is for a chosen few. Extra hot means exactly what it says, Extra hot. There are people out there that might not agree with us because they like Hot and would think that this degree is nto Hot enough for them. There are a few people that can eat fire, and if they want to try Fire then they can go to the next step Extra, Extra Hot. This style is for a only those who can really stand the HEAT. Extra, Extra hot means exactly what it says, Extra, Extra hot. There are people out there that might not agree with us. There are a few people that can eat fire, and if they don’t agree with us on the above statement, well its their right to do so. We also make mild "dry cured sausage". This is made with fennel seed instead of black pepper. This has a totally different taste than sopressata. 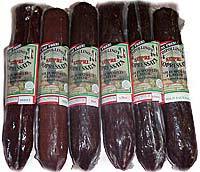 If you enjoy Italian sausage than you will love this dry cured product. All of our “SUPRI” products are priced at $19.00 per pound. Minimum orders of one pound please. We will try to fill your order exactly as you order it. Slicing is available for a small fee. All products are vacuum packed for freshness. Packages need no refrigeration until they are opened. Enjoy “SUPRI” alone or in your favorite recipes. Our Sopressata and sausage can be enjoyed simply as an appetizer or a great hors doeuvre. It can also be added to pasta sauce to enhance flavor. It can be sliced thin for salads or antipastos. The slicing “SUPRI” which is about a 4" diameter can be enjoyed in sandwiches, heros, hoagies, subs, grinders, etc, etc. Italians make a fantastic 'Fritatta' omelet, using eggs, ricotta cheese, mozzarella cheese, with basket cheese and “SUPRI”.